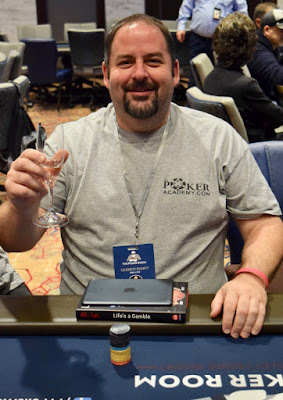 All in on the turn for his last 73,600, Rep Porter had one challenger move over-the-top of him all-in, with action over to a second challenger who already had bet 40k on the turn with the board reading Q-A-4-J. The challenger dipped 3 minutes in to the clock before folding Ace_Queen (TopTwo) face up. Porter tables Pocket_Fours for a flopped bottom set.